Eco-Pan is the leader in concrete waste management services. We help our customers comply with environmental regulations, avoid fines, and recue their compliance costs. We deliver watertight pans to job sites to collect concrete washwater and pick up the pans to deliver to recycling centers for a turn-key solution to customers compared to the alternatives. Our commitment to customer service, the time-saving methods of handling concrete waste disposal for our customers and the prompt service in getting the washout bins you need is second-to-none. Eco-Pan is a unique industrial washout containment system designed to contain cementitious materials from industrial and construction sites, which may be harmful to the environment. Our unique design allows for site portability and ease of handling, and our response times help contractors comply with today's job site BMP's, SWPPP requirements and LEED recycling. 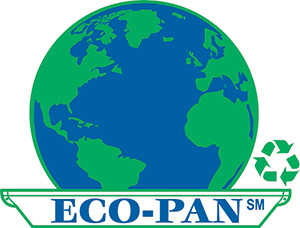 As of April 30, 2018, Eco-Pan operates out of twelve markets in the United States, but is expanding to meet customer needs.